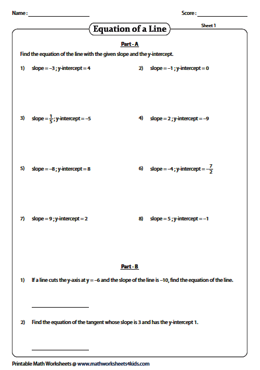 Test your comprehension on equation of a line using the slope-intercept formula in this batch of worksheets. Learners will be required to convert the linear equation to slope-intercept form and identify the slope and y-intercept based on the linear equation provided. They will also frame the equation of a line; write the equation of a parallel or perpendicular line in y = mx + b form based on the given slope and intercept. 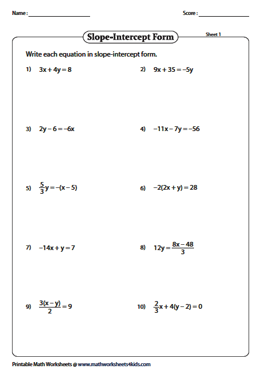 These worksheets are suitable for Algebra learners from grade 6 and up. Convert the given equations into slope-intercept form y = mx + b and write them down. 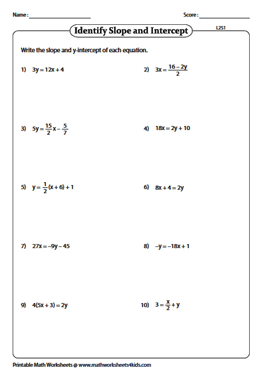 Solve thirty equations spread over three worksheets and use the answer key to verify your responses. Identify the slope m and y-intercept from the assortment of linear equations in slope-intercept form. The equations are written in the form y = mx + b where m is the slope, and b is the y-intercept. 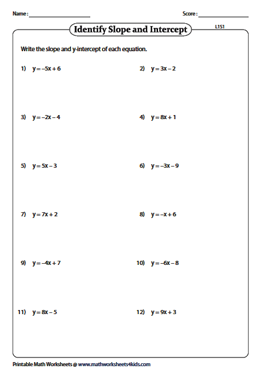 Based on the linear equations expressed in various forms in this set of worksheets, students will need to find the slope m and y-intercept by converting each equation into slope-intercept form. The slope and the y-intercept is given in each problem. Apply slope-intercept formula and find the equation of a line in this series of worksheets. Download this set of worksheets for a great learning experience! 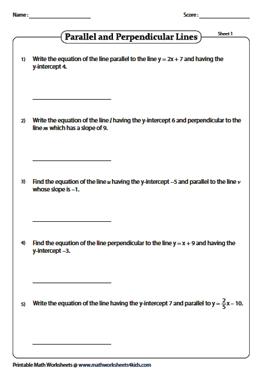 In this bunch of worksheets, write the equation of the line with the given y-intercept and is parallel or perpendicular to another line. Record your answers in slope-intercept form. 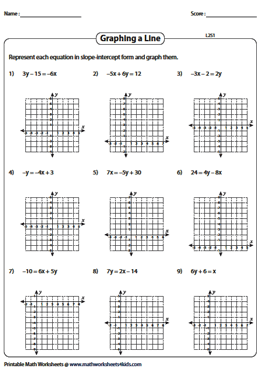 Use this set of worksheets to graph the line based on the slope and y-intercept provided. Plot y-intercept on the grid and mark another point using the slope. Draw a line joining those two points. Convert the given equation to slope-intercept form. Identify the slope and y-intercept and graph the line. 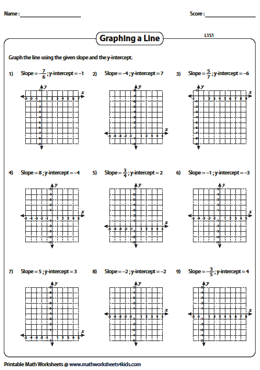 Each worksheet has nine problems graphing linear equation using slope and y-intercept.